A proof will be sent for approval to the email address provided. Please allow 3-5 days after you have approved the proof for your order to be custom made before shipping. Show allegiance to your state. This custom map art includes an outline of a state, a date, and the name(s) you choose. The entire design is given dimension inside a shadow box frame. Celebrate a wedding, graduation, anniversary, or special occasion by framing a beloved time and place. Dimensions: 13" x 13" x 1.5"
This was a fan favorite of the bride and guests at the shower! 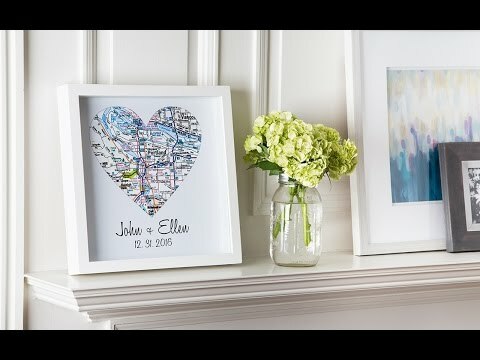 Memorialize the who, when, and where of important moments with custom map art. Each shadow box illustration from Define Design 11 includes a skyline or a bird’s-eye view of your chosen place. You further customize by adding names and a date. Commemorate any significant event or location—whether a wedding, graduation, birth, or just your allegiance to your hometown. Maker Sandrine Froehle’s first shadow box was for her newborn daughter. After she launched on Etsy, excited customers kept requesting custom designs for baby showers, graduations, and anniversaries. Sandrine’s business kept growing from a one-woman operation to a small business with three full-time graphic designers. Their artwork is something most anyone can appreciate. They make it easy to give a thoughtful gift—since they do all the personalization for you.